The government has been quiet on this month’s employment stats so far, which is usually a sign that ministers made too big a deal of the good news they’ve spun out of the previous month’s figures and are now trying to keep a low profile as the ‘progress’ goes backward. Either that or I’ve just missed them making a big deal out of it – they’re by no means above trumpeting good news that just isn’t there. Unemployment is exactly static compared to the October release at 2.601 million. The adjusted figures show a fall of 50,000, but this is entirely notional. The July-October quarter figure (the most recent in the November figures) of 2.601 million is up by 82,000 compared to the preceding Apr-Jun quarter, just as the June-Sep quarter (the most recent quarter in the October stats) figure of 2.601 million was up by 95,000 compared to the preceding Mar-May quarter. So the trend in real unemployment is an increasing one, however much the government might crow otherwise. As in so many areas under this government, women are being affected far more severely than men. Of this month’s increase in unemployment of 82,000, the number of unemployed men rose by 22,000 – very bad news for those men. But the number of women rose by much more – 60,000 compared to the previous quarter. This government has shown again and again that disabled people do not fit into its ‘everyone must pay their way’ ideology, demonising the disabled shamelessly and introducing measures that will push hundreds of thousands of them and their families into poverty. 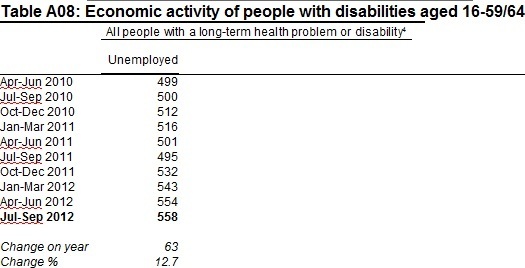 In spite of Iain Duncan Smith’s claim that he only wants to get people out of unemployment into ‘proper jobs’ (Remploy doesn’t count in his book), the Tories are singularly failing to reduce unemployment among disabled people: unemployment rose for the 4th quarter in a row and is far higher than at any time since figures for disabled people began to be recorded separately. The increase in unemployment among young people (16-24) was actually higher (it rose by 87,000) than the increase in the overall population, as it was offset by small falls in a couple of other age groups. This government’s policies are forcing more and more young people out of work – at the same time as the government is planning to bar them from housing benefit. So if you’re in any doubt about how the Tories view the majority of this country’s young people, you shouldn’t be. While the number of people out of work rose, the number of people claiming benefits fell in both the unadjusted figures, but rose in the adjusted ones. This shows the nonsense of the government’s claims – unemployment is supposed to be falling but benefit claims are increasing. So we have a theoretical fall in unemployment and a real rise in the claimant count. The raw data shows that the government is creating unemployment – but at the same time forcing people off benefits even though only one vacancy exists for every 5.43 unemployed people. So much for ‘compassionate Conservatism’. Average earnings fell in the most recent quarter in both public and private sectors. At the same time, inflation rose from 2.2% to 2.7% according to the most recent ONS data. This means that the ordinary, working people, ‘those who work hard and do the right thing’, as the government likes to call them when it’s demonising the unemployed, are facing a continuing and worsening real-terms cut in wages – as the government cuts taxes for the richest. In previous analyses I’ve argued that the increase in the number of self-employed people means nothing like the government’s claim of a rise in entrepreneurship and the creation of new businesses – but is actually a symptom of desperate people trying to make a living through self-employment because no employed jobs are available, and without any guarantee at all that they’d actually be able to make a living. Well, this month’s figures support that interpretation. The number of self-employed people fell for the first time under this government – as people find they can’t earn enough to survive and are forced to register as unemployed. The number of people working part-time increased yet again from last month’s record level – by 50,000 according to the seasonally-adjusted figures, co-incidentally exactly the same number as the theoretical decrease in unemployment. So, even in the government’s ‘fantasy’ figures, it’s unable to create full-time jobs to get people out of unemployment and can only offer part-time jobs. Hardly a sign of the resurgent economy the government would love us to believe we’re seeing. Not only is part-time work at record levels, but temporary positions rose by 53,000. The UK’s people are being forced to take insufficient, insecure work to try to make ends meet while companies make huge profits. It doesn’t take much to guess whom this government really cares about. Long-term unemployment – both over 12 months and over 24 months – rose again and are at the highest levels they have been since the coalition government took office. The government’s policies, for all its determination to demonise the poor and unemployed, are only increasing the numbers of people who have been out of work for years with no hope of finding a job. As MPs return to the Commons this week, no doubt at some point Cameron or one of his stooges will try to crow over the theoretical fall of 50,000 in the headline unemployment figure. It’s not true, like most of what he says – and I hope an opposition member will be brave enough to nail him or her on it.